Does anybody remember the Gas Station Cozy project which was first unveiled about seven months ago? 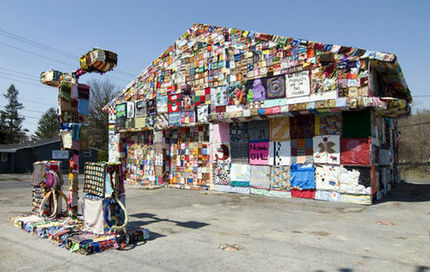 Earlier this year, a woman named Jennifer Marsh decided to cover an old, abandoned gas station with a cozy made up of squares of knitting, crochet, and other fiber arts, as well as recycled plastic. In doing so she managed to bring together a wide community of people eager to help . . . and also ignited a bit of controversy on at least one of the knitting forums I frequent. I was reminded of this art piece today when someone on Knitting Help shared a very different project, this one created by Extreme Knitter Rachel John back in 2006. The video shows how, with the help of sponsors and assistants, she gathered together many different colored yarns, in both balls and cones, and pulled them all together until she had 1,000 strands −− and then she knit with this as a single strand on two very big pieces of wood for knitting needles! I was impressed by the dedication, the patience, and the physical stamina it must have taken to see the 1,000 strand knitting project through to the end. If it had been me, I wouldn’t have gotten very far before getting discouraged and looking around for something a bit easier to tackle! My favorite part of the above video is where all the strands have been collected and are running up and over the upstairs railing — the sight of all those multi-colored strands reminded me of rays of sunlight streaming through a stained glass window. And since I tend to run into trouble any time I try to knit with even two strands held together, I can’t help wondering: how did she keep the whole thing from turning into a tangled mess?! Sadly, I think this person was completely serious. It was this comment that brought the gas station cozy back to my mind and the confusion I felt when I read posts by a few people (knitters, presumably) who opined that the project was very self-indulgent and foolish, that the people participating had “wasted” good yarn as well as their time and energy, all of which could have or should have gone to help needy people. Now, I don’t want to be rude; I don’t want to insult or belittle anyone; I have no desire to start a fight, although I don’t mind intelligent debate. But since this is my blog, I just have to say . . . It’s ART, people! Art is its own end and its own reward! It’s there to make a statement, or to make you stop and think, or to make you smile, or something. It’s not a WASTE of time, materials, or energy. It’s not supposed to take the place of helping people less fortunate; it has nothing to do with that! I really wonder, do the people writing these comments honestly think that if yarn (and other materials) had not been used to make the gas station cover that same yarn would have instead been used to clothe homeless people or wrap orphans in blankets? Do they feel that Jennifer Marsh STOLE the yarn from charity knitters in order to toss it into the garbage and utterly waste it? The term Art For Art’s Sake came to my mind, so I did a little bit of research. The Britannica Online Encyclopedia explains the phrase: “A slogan translated from the French l’art pour l’art, which was coined in the early 19th century by the French philosopher Victor Cousin. The phrase expresses the belief held by many writers and artists, especially those associated with Aestheticism, that art needs no justification, that it need serve no political, didactic, or other end” (The bold is my emphasis). All right, let’s insist that nothing that we do with our yarn be anything but practical and beneficent. No extra gauge swatches, no cute little toys knit just for fun, no decorative throws or wall hangings — all of those things are knit with yarn that could have gone to clothe a needy person. And let’s look at the gas station cozy again. If the yarn used to knit the squares was recycled and consisted mainly of scraps, do these people have a genuine complaint? How about if it was NOT recycled but was bought expressly for use in this art installation? Okay, let’s pretend that the gas station project did not exist −− how does the yarn that might have been used for the project get to these people that don’t have? Do you seriously believe that those people cannot be helped BECAUSE that project exists? In fact, if you look at the project and you feel angry because there are cold, needy people, then guess what? You can do something about it −− you can start knitting sweaters, blankets, and mittens for those folks, or you can donate yarn to someone who will knit them, or you can donate money to help them. If you’re so angry, it seems like you’d better get busy. If you don’t, how is that the fault of the people who created the art piece? Next PostNext Been a long time . . .